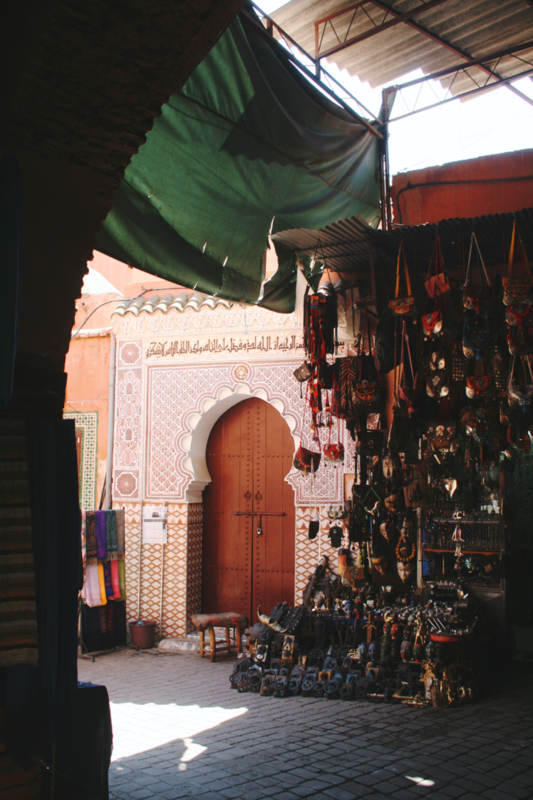 Marrakech is probably my favourite city for shopping, thanks to its treasure-trove souks. It’s also one of the most gorgeous cities I’ve ever visited, with stunning culture and a wonderful atmosphere. 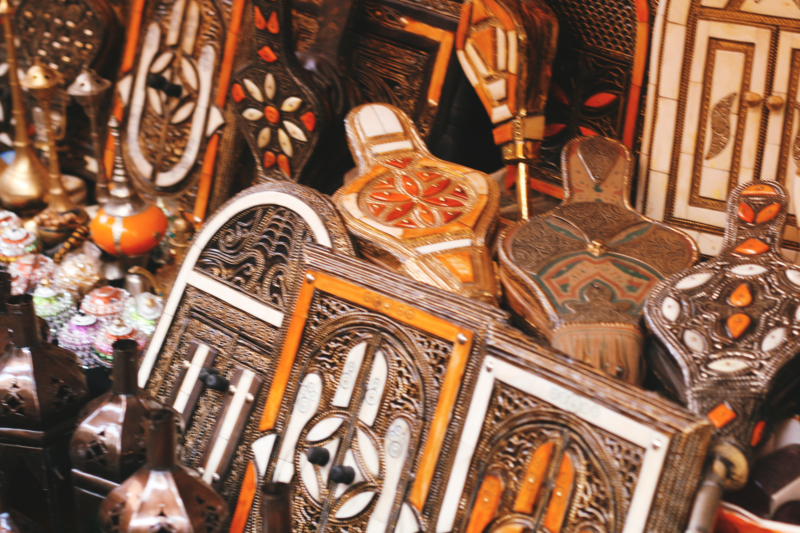 But particularly if you’re on the hunt for gorgeous homewares and great bargains, the souks of Marrakech are hard to beat. 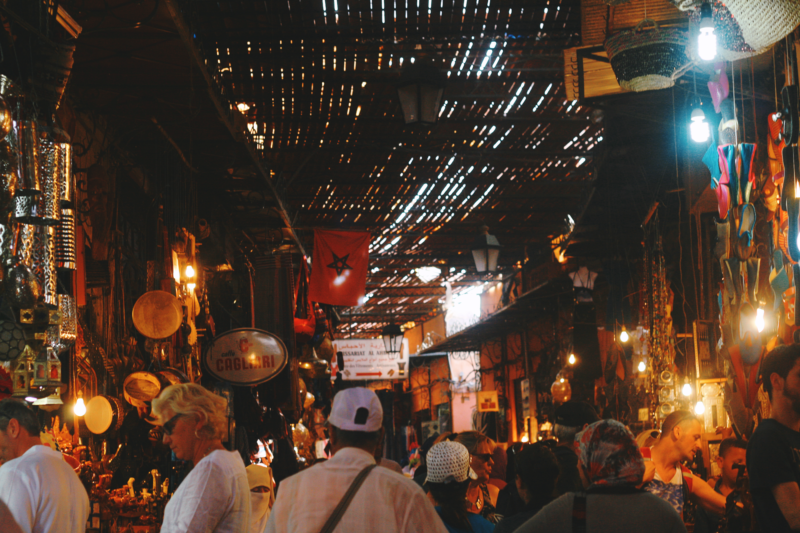 However, if you’re not used to haggling, bargaining and the fast-paced, non-fixed way of shopping traditional to Marrakech (similar to – but in my experience, more intense than – the psars and markets of South East Asia and India), it can be a bit overwhelming knowing where to start and making sure you’re not being had. 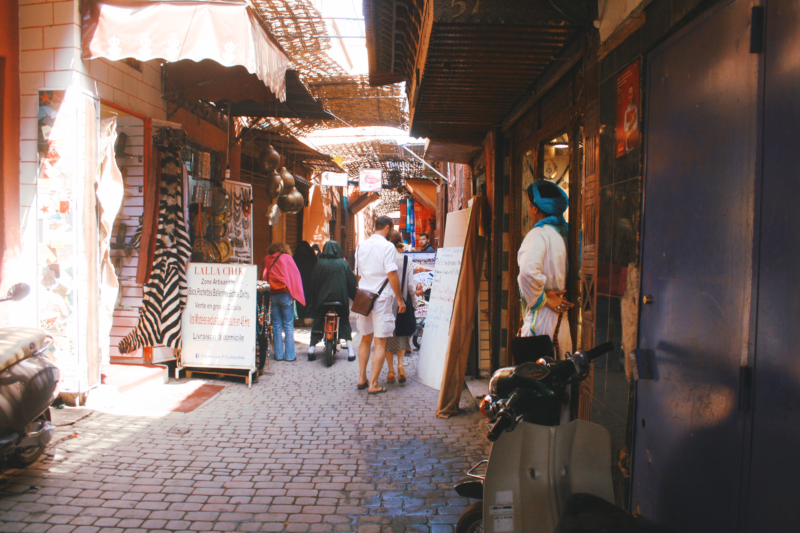 To properly explore and get the most out of the souks, dedicate at least a full day to exploring them. You could split this up over two days – two mornings, for instance, if you’re not a big shopper. If you’re a shopaholic like me you’ll love a full day exploring and then perhaps another morning once you’ve decided on your final purchases. Even if you don’t like shopping, the experience of exploring the darkened alleyways, rounding onto a lantern-lit square hung with carpets and scented with incense is just pure magic. 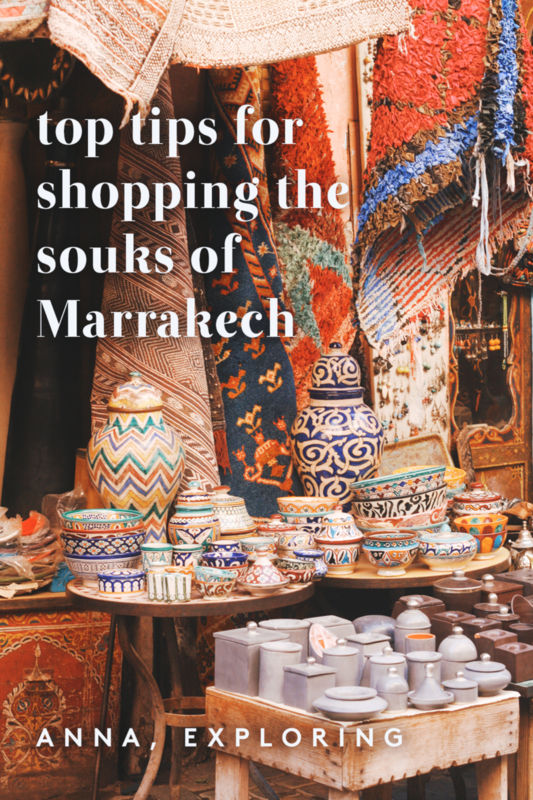 I’m sure if you’re considering visiting Marrakech you’ve already heard this, but it’s essential to bear in mind as it’s expected and is standard practise. 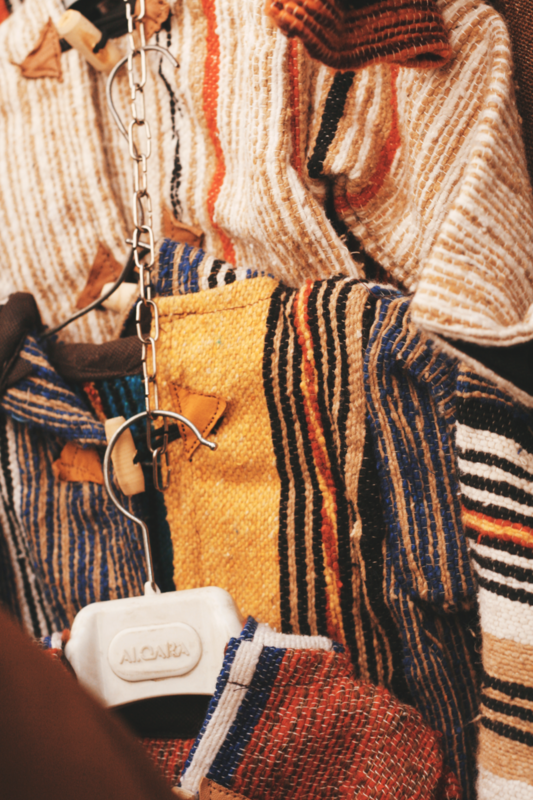 You can get up to two thirds off the original price if you’re very confident and an advanced haggler – I averaged about 25-50%. My best deal was a silk throw for about 60% off the original quotes price! 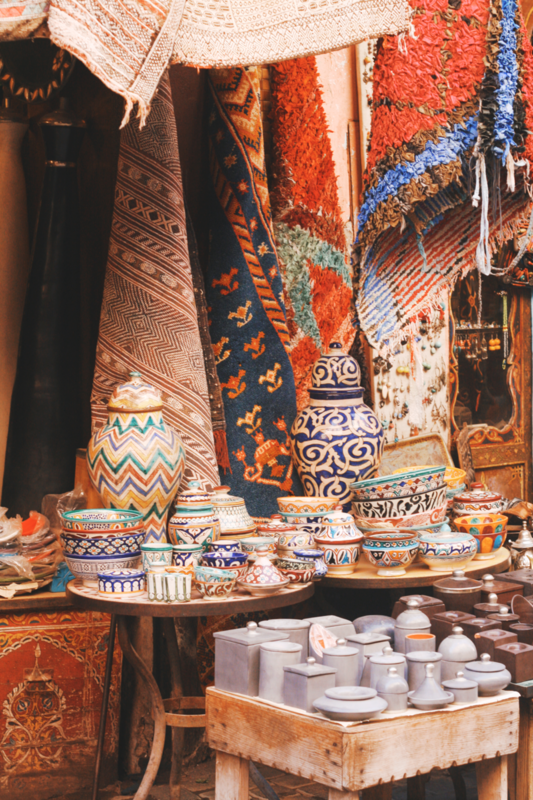 The best way to deal with the hassle of haggling – especially if this kind of thing is stressful to you – is to treat the whole thing like an ongoing joke or game. The shopkeepers themselves don’t take it too seriously, and (usually) haggle with a smile on their faces which makes it easier to deal with. It’s easier said than done, but try not to get cross with the situation – at the end of the day, it’s an experience to be had, and unless you’re buying something huge, it’s likely only to be a couple of pounds you’re haggling over so it’s no harm done if you don’t get your way. That being said, if anyone gets aggressive with you, always walk away. You don’t have to stand for aggression! Again, it’s common advice, and helpful to boot. 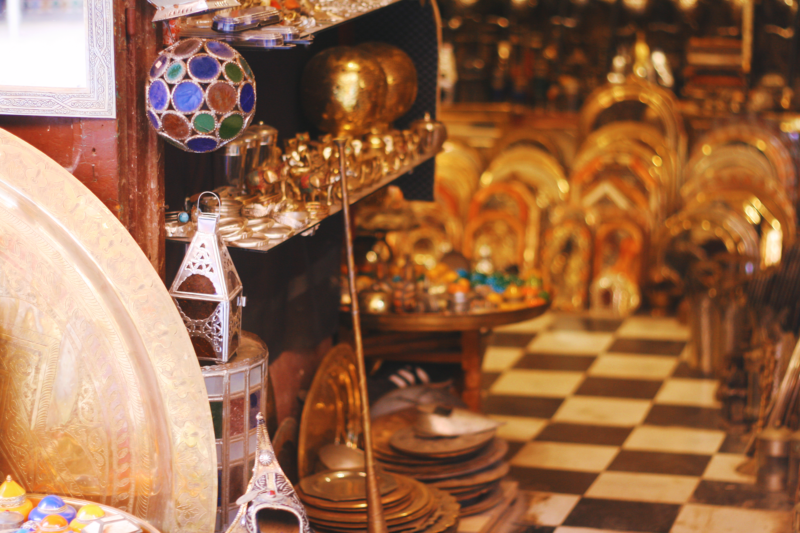 Especially in Marrakech, you’re likely to find a cheaper deal for a similar item elsewhere. However – always remember where you saw the thing you’ve fallen for first. Sometimes you won’t find something exactly the same, or the little detail you hoped would be replicated is missing on the other stalls. With GPS maps, it’s even easier than ever before to drop a pin to get back to where you were. Or, more reliably, take a photo of a nearby landmark so you can get back to where you were or ask for directions. I got caught out by this! When negotiating with a shopkeeper, I suggested a price, stuck out my hand and he smiled, took it – and claimed a higher price as we shook! The only thing you can do in a situation like that is laugh and respect your friend’s better technique. But that was something I was very aware of and it’s stuck with me on my travels when haggling with people! More often than not, all you need to do is walk away from a stall to get an instant money-off offer. If you’re on the fence, this is usually a good tactic to take! It does also mean however that if you’re just leaving a stall because you didn’t like the item up-close, you’ll be followed by cries and persistent discounts which can get a bit tiring. Sometimes moths can live inside the fabrics of the souks, especially given the heat, dust and age of some of the shops. To keep your clothes, bags and belongings safe, bring a bin liner or two and wrap up your purchases inside. When you get home, freeze the fabric for a day or so to kill the moth eggs. The heat can get intense! 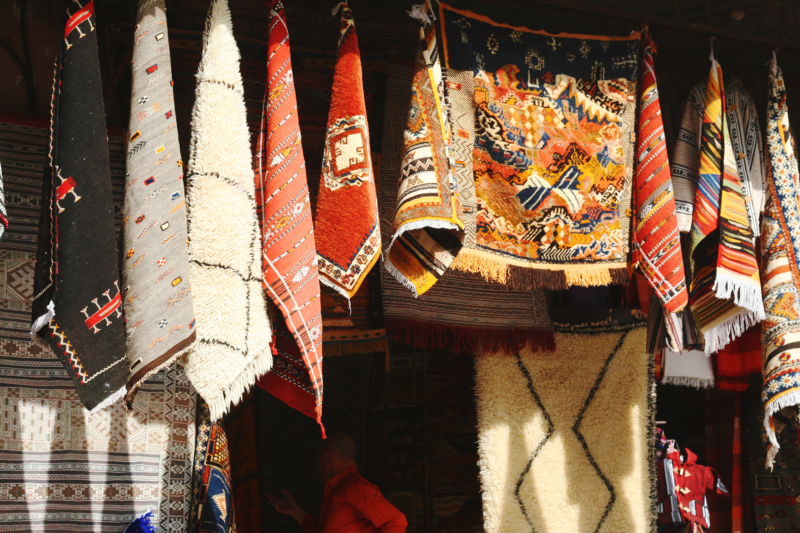 The fabrics of Marrakech and Morocco are unlike any I’ve seen in Asia or Central America. They’re beautifully rich – if I’d had a bigger suitcase, I would have bought a lovely big carpet. As it was, my silk throw is rich and beautiful and I’m looking forward to having my own place to show it off in! The lanterns range from huge floor lamps and intricate ceiling ones all the way to small hammered metal lamps for tea lights. Again, though I’ve seen similar offerings in Asia, I’ve never seen anything that has matched the craftsmanship and ‘authentic feeling’ of the lamps of Marrakech. I have two tiny tabletop ones and I absolutely adore them for the shadows they punt out and warm feeling they give. Finally, smaller ceramics are always a good bet as they easily fit in a backpack or suitcase and are relatively safe when wrapped up in a t-shirt or scarf. By ‘regional’, I mean – don’t get yet another tiny bowl (if you’re anything like me, I’ve got far too many tiny bowls!). 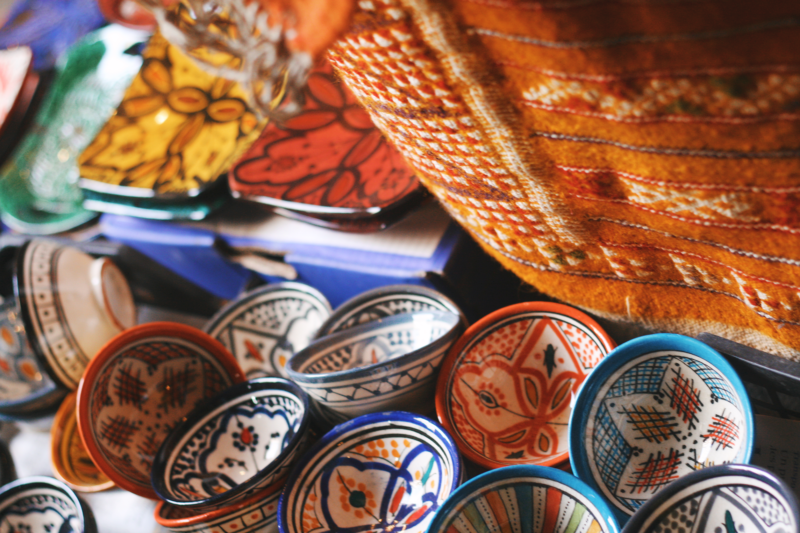 The food of Morocco is stunning and you can bring home a useful and beautiful souvenir in the form of a tagine, or a tiny jam-and-honey serving platter. I also bought a stunning beaded and mosaic mirror – I tried to take a photo but my DSLR skills were a lot worse back in 2015, so it’s a bit blurry! I’ve never seen anything even remotely similar elsewhere in the world, so I’d recommend keeping an eye out! I loved the tiles of Marrakech too – they’re at their most beautiful in the stunning mosques and heritage buildings you’ll see on your trip. I’ve always thought that one day, if I have my own house and lots of money, I’d go over and ship a crate of tiles back from Marrakech as they’re just incredible. Pick these up when you see them – it’s a great photographic opportunity, too! 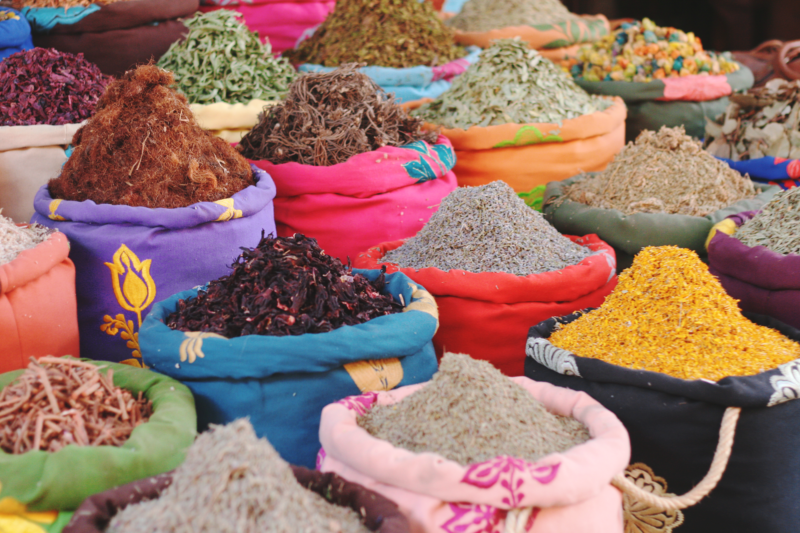 I’ve never seen the spices piled so high and so colourfully as in Marrakech. If someone approaches you with items outstretched, walk away. Twice, I got caught up in a confrontation – once, with a woman who pre-emptively started henna-ing me (which I didn’t want) and then demanded payment even when I whipped my hands aside, and secondly with someone who tried to get me to buy a flower. The shopkeepers and stallkeepers will probably call out to you to come and look at things, but if anyone tries to follow you with an item, keep walking and look straight ahead. You might end up having to pay to get out of the conversation (like we did) otherwise. There’s really nothing like it! Depending on how well-trodden a street is, the price is likely to be higher. The closer to the touristy areas, the more likely you are to get “ripped off”. It’s easier to prevent impulse-purchase-regret if you have a price in mind before you buy. Give yourself a bit of leeway – but if you’re concerned you’ll overspend, this is always a good move. As you browse the stalls, you can get a sense for whether or not your mental price is appropriate. Make sure to explore (but bring some kind of map)! 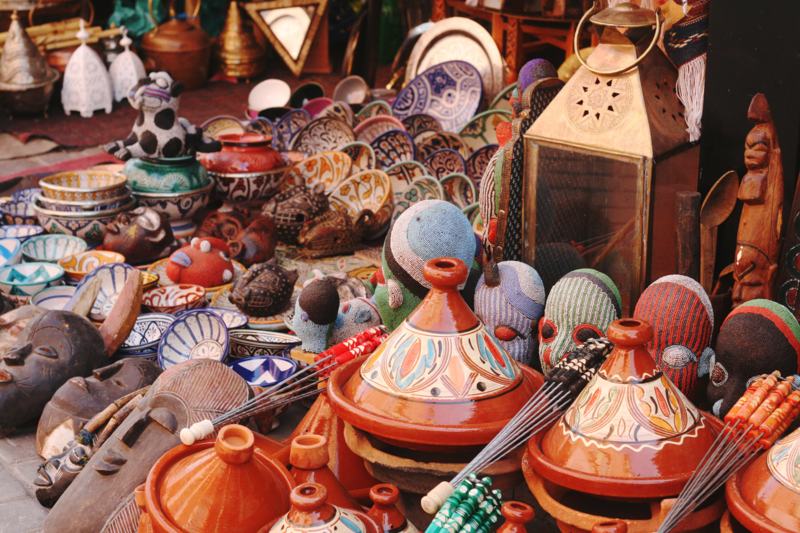 As I’ve mentioned, the further you go from the touristy, well-trodden areas, the more likely you are to find a) unusual and unique, non-“touristy” souvenirs and items, b) get a better price and c) have a unique experience. I always love exploring side-streets and smaller alleyways. You get better photographs, the pace is slower and everything is more quiet. You’ll see glimpses of real life for the locals, you’ll be less aggressively targeted and you can take your time. 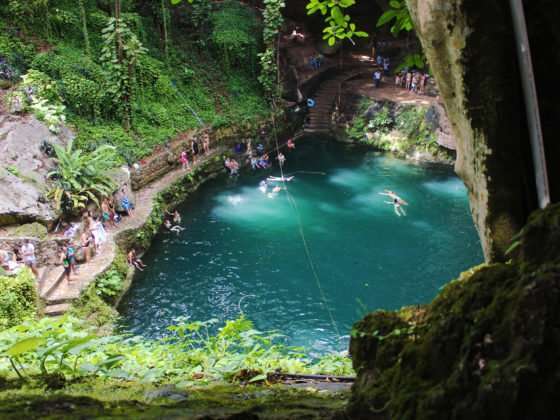 Finally, the experience you have exploring on your own will be personal to you and you’ll have your own stories and memories to bring back, rather than the well-trodden paths of the LP. 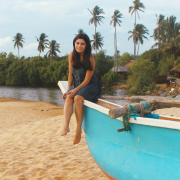 (Don’t get me wrong, I love the Lonely Planet and am a huge LP fangirl, but I like to mix up the excellent LP walking tours with my own explorations to get a full sense of the place – both the must-see highlights and my own experiences). There are no bargains, just lots of scams and over-aggressive sellers. It’s almost impossible to even cross without getting harassed. Have a drink at one of the cafes overlooking the square to get an experience of it. Finally, bring a big bag! Especially if you’re a shopaholic, like me (oops). 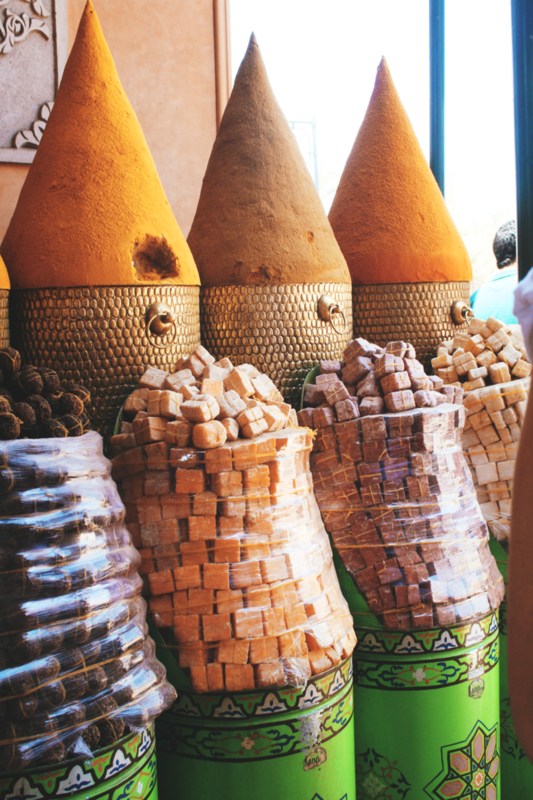 I hugely, hugely recommend Time Out Marrakech – yes, it’s a bit out of date now, but for the walking tours of Marrakech’s classic sights and a general overview I don’t think it can be beaten. I highly recommend following their ‘On Foot’ tours, particularly of the Palaces and Tombs (p79). 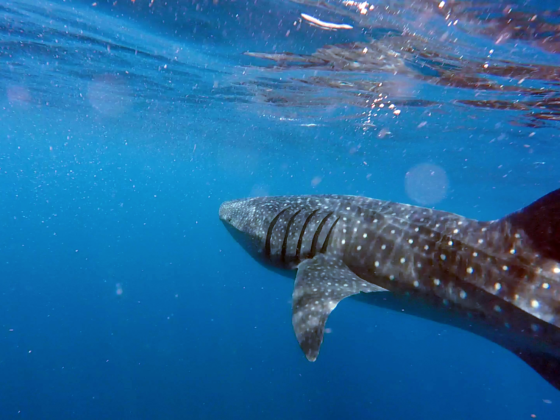 You won’t get the beaten-path blue-book (LP) experience, either, which means you’ll see some new places! You could follow it up with the Pocket Lonely Planet or a DK Top 10 (another favourite of mine – though I’ve not read the Marrakech edition). Don’t forget to wear conservative clothing, particularly if you’re a woman. 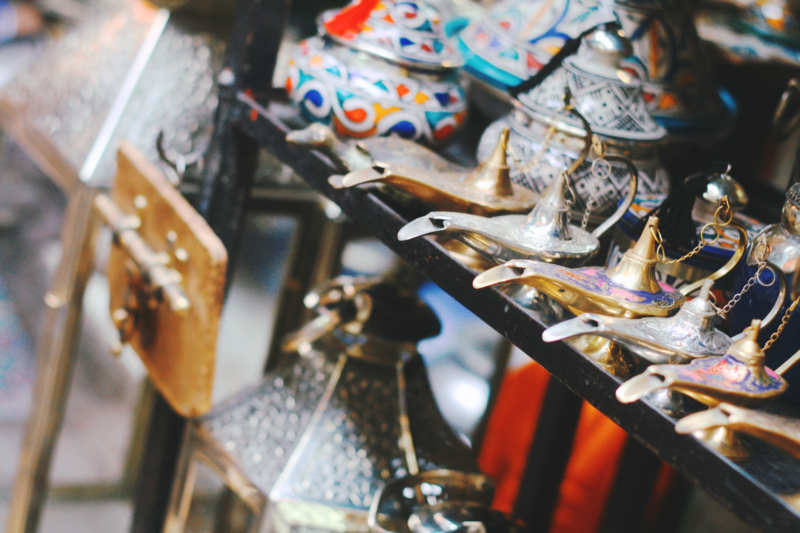 Have you been to Marrakech? What was your top buy? Disclaimer: This post contains affiliate links. This means if you purchase through those links, I get a small commission at no extra cost to you, which helps with the costs to keep this website running!